Hi there! You can now integrate Scanii with S3 without writing any code using AWS lambda, find out more about it here. A question we get all the time revolves around using scanii to virus scan user content stored in Amazon's S3. In this article we will cover one of the many ways this can be done by utilizing Scanii's fetch mode coupled with S3's query string authentication (sometimes refered to as "pre-signed" object url) to securely and asynchronously virus scan content stored in S3. ☛ This article requires a basic working knowledge of S3 and fairly minimal experience with Scanii’s APIs. All examples utilize cURL - a command line HTTP client - but should be easily translated to any programming language. 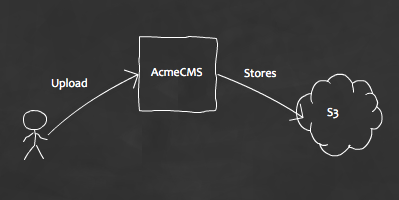 For sake of this example, lets assume that company Acme.com stores its user-generated content in Amazon S3 via its internal content management application called AcmeCMS. Now let’s say that Acme is concerned that malicious user generated content could spread to other users of the system since this is, in essence, a content sharing platform. To solve this problem, Acme engineers decide to introduce an arbitration mechanism in which user generated content is hidden from other users until it is virus scanned and sanitized. 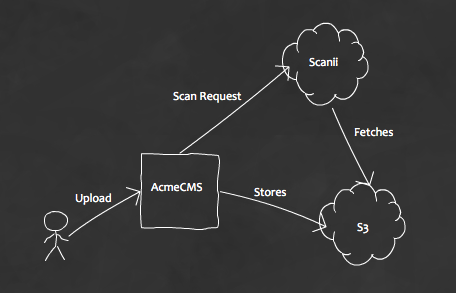 In this new workflow, AcmeCMS marks all user-generated content as pending arbitration before storing it into S3. Once that is done, it notifies Scanii that new user content must be scanned using the “fetch” API. Finally, once AcmeCMS has received the scan results from Scanii, it should remove the pending arbitration flag from the user content.